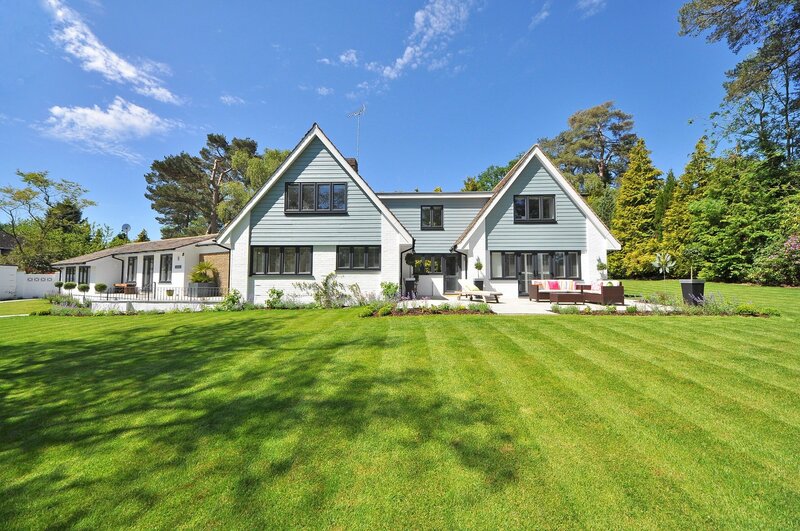 This is Post #2 in the 2019 Home Trends to Watch Series. See Post #1 here. ELLE Décor has been an authority on home décor for many years, reporting on the most influential styles and trend. 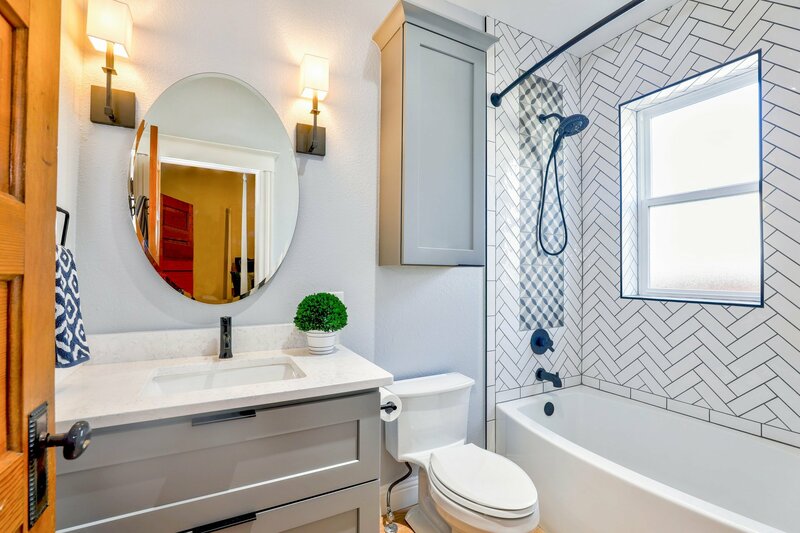 They recently released their selection of home design trends to watch for in 2019, and we’ve been highlighting ways to incorporate them into your own home. First on the list was Floral Fabrics and Wallpaper. Next, we explore the trend of Rich Jewel Tones with an Edge. If you followed our 2018 Home Trends to Watch Series, you may see some similarities between this trend and last year’s Iridescents and Intense Colors. 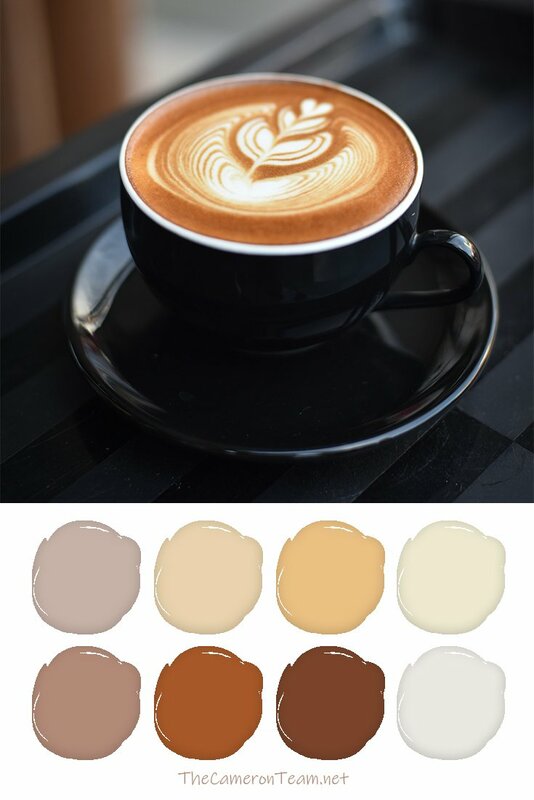 While both feature bright colors, 2019’s trend incorporates white and black as backdrops. This creates eye-popping contrast in the home’s palette. This trend is brought to light by John Andrews Design. His Calabasas project features multiple examples of this trend, so make sure to check out the gallery. 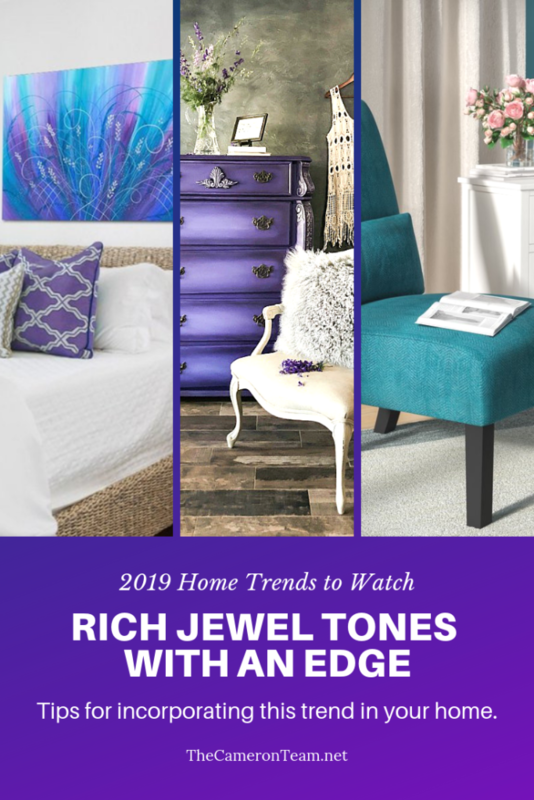 Want to up your design game for 2019 and reproduce Rich Jewel Tones with an Edge in your own home? It’s easy! Here are our tips. The foundation of this trend is built on contrast. So, the first step of creating it is to make your wall color and trim white or black (or white and black). Just remember that dark colors make a room look smaller, so all black may not be the best choice for a small room. If you’re feeling bold, black and white stripes work great. Kim Stoegbauer of TomKat Studio painted her shop walls with black and white stripes, and it looks fabulous. You can see pictures of the process on her blog, as well as the type of paint she used. Also on-trend are black fireplace mantels and built-ins. Designer Katie Ridder did it beautifully in this living room. The black really makes the colorful artwork pop. It’s important to note that if you choose to paint any portion of your room black, there are indeed different types of black. Some blacks are warmer than others, some are cooler, and that slight difference can affect the mood of a room. If you are planning to incorporate primarily red and purple jewel colors, a warmer black may look better (while a cooler black may look better with a blue palette). Considering your options before choosing your paint could be the key to making your room look more congruent. 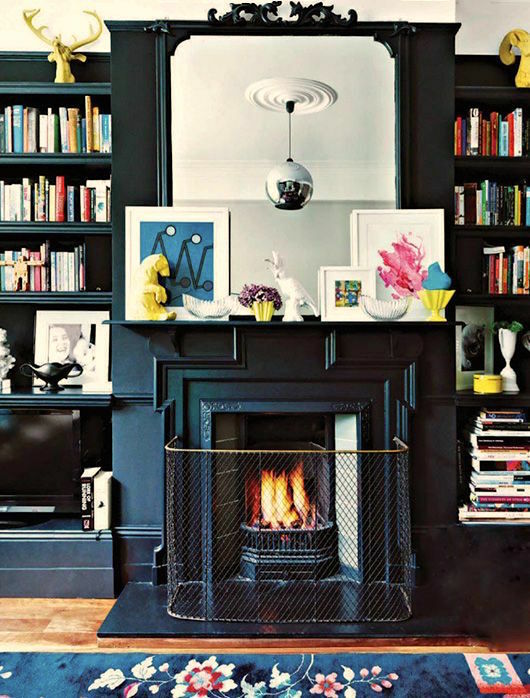 If you need help narrowing them down, check out “The Best Black Paint Colors”. Now that the background canvas has been set, it’s time to start adding pops of color. Furniture is a fun way to do that, especially with the nice array of jewel tone in couches, sofas, and chairs. 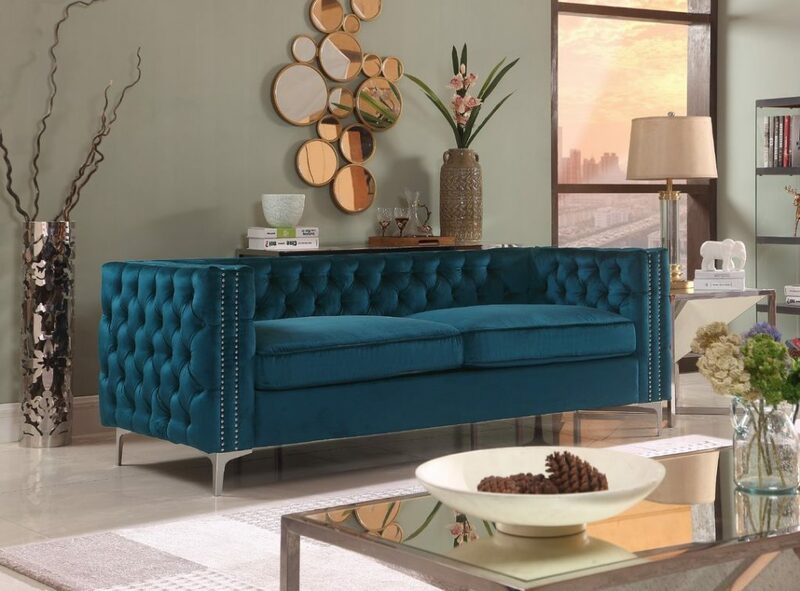 For example, this Kaye Sofa from Mistana is a lovely emerald green color. It’s also designed in the Scandinavian style of simple lines and natural tones (Hygge, anyone?). Like big, comfy sofas? 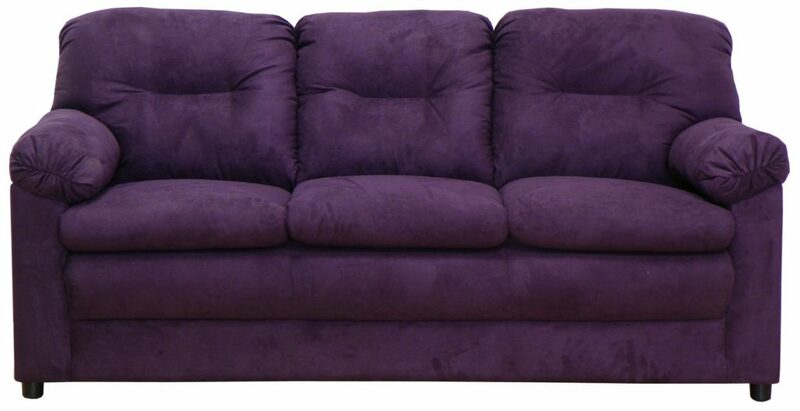 The Mcallister Sofa from Red Barrel Studio has a rich amethyst purple hue and all the plush softness you’ll love. 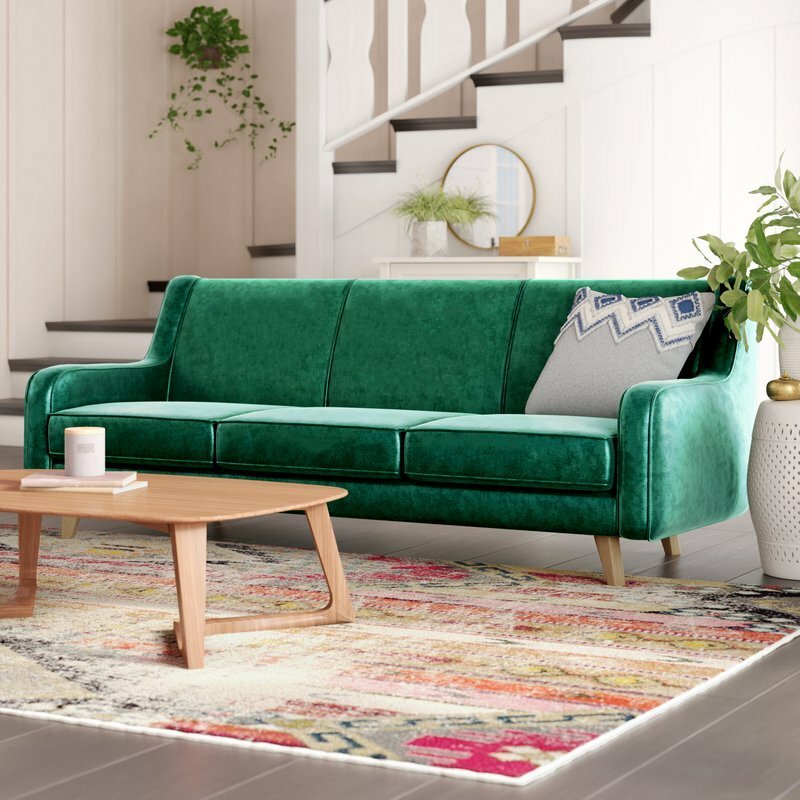 One of the great things about jewel tones is that they work well with luxurious velvet upholstery. But be warned, sitting on a sofa like the Marlon Chesterfield from Rosdorf Park will have you saying “darlin’” and craving dirty martinis. 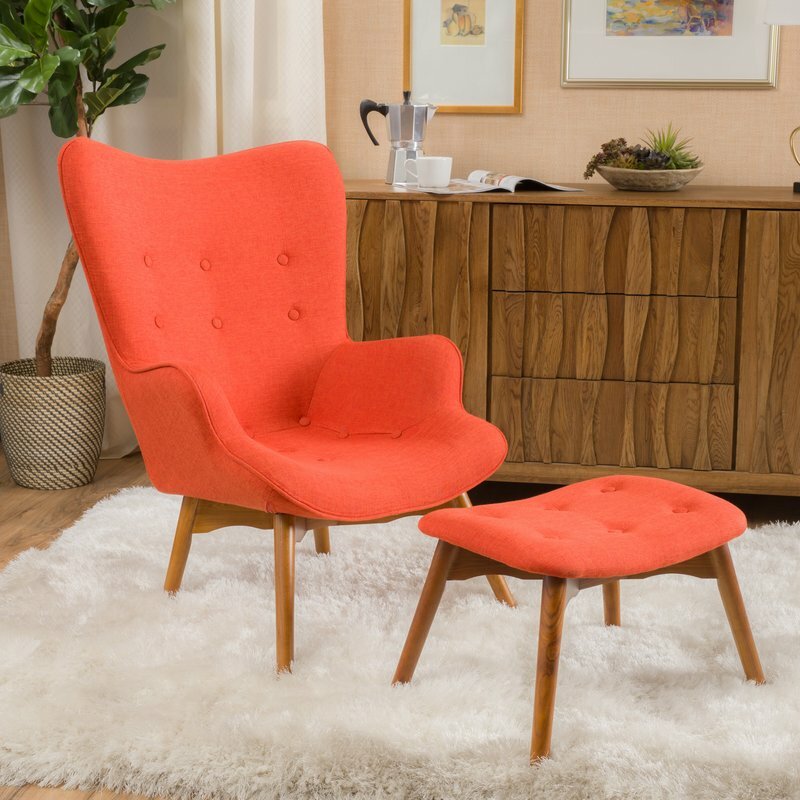 If you aren’t ready to replace your sofa, this Canyon Vista Lounge Chair by Langley Street is a beautiful, bright orange. The feet are a natural wood color and the ottoman is included. Looks like a nice place to curl up and read a book! The Randi Slipper Chair by Zipcode Design is upholstered in a pretty teal chenille and the legs are a deep espresso color. This size chair works great in smaller spaces, like a bedroom sitting area or sunroom. Bright colors are in style for tables, dressers, hutches, and other wood pieces. If you don’t want to purchase a whole new piece, consider updating an old one. 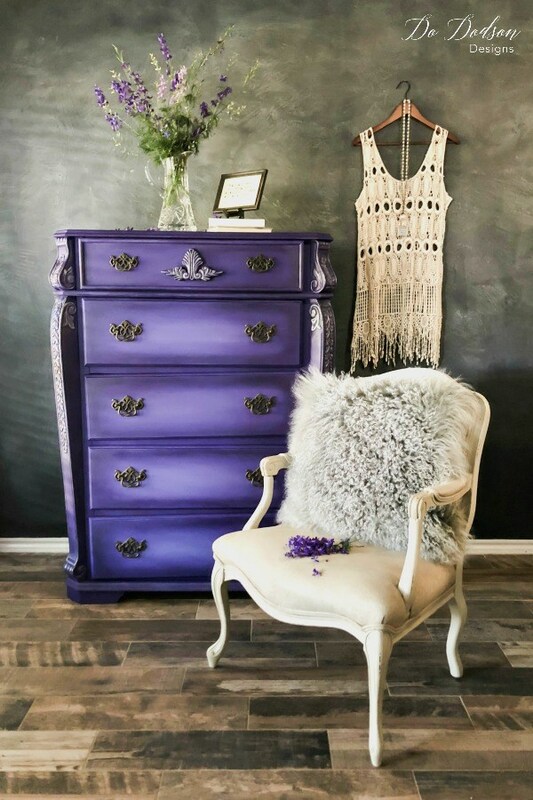 A great example is this amethyst purple dresser makeover from Do Dodson Designs. She shows how she completes the project step-by-step on her website and shares where she got this gorgeous amethyst paint. Like whimsy? 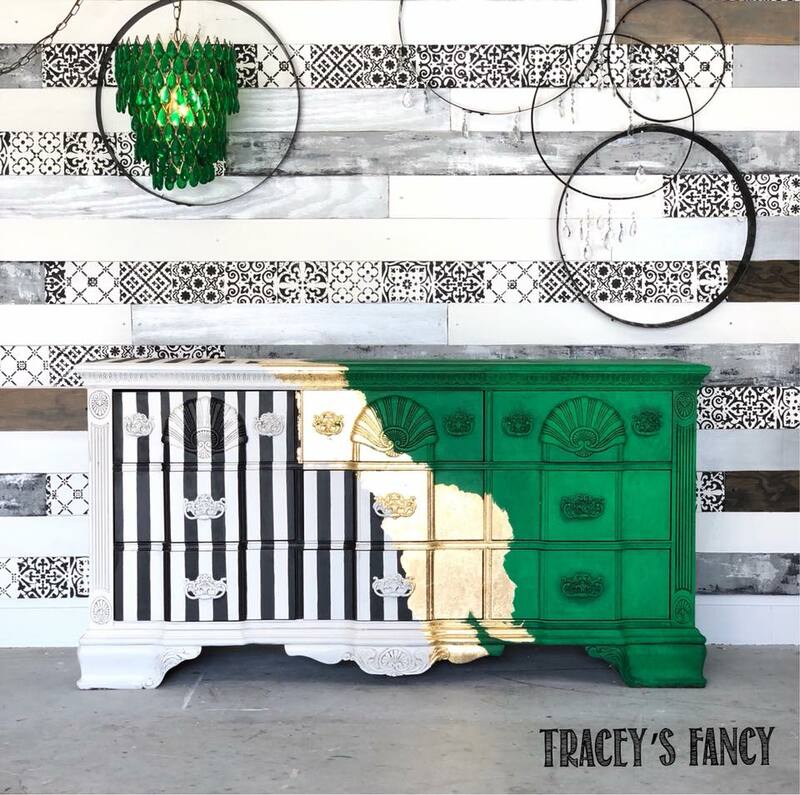 This dresser is by one of our favorite furniture designers, Tracey Bellion of Tracey’s Fancy. She’s never afraid to use color, and this dresser not only has black and white stripes but also solid emerald green and gold. Check out her blog to see the before and after, and the paints she used. Want more furniture makeover ideas? Be sure to follow our Pinterest board, Fabulous Furniture Makeovers. 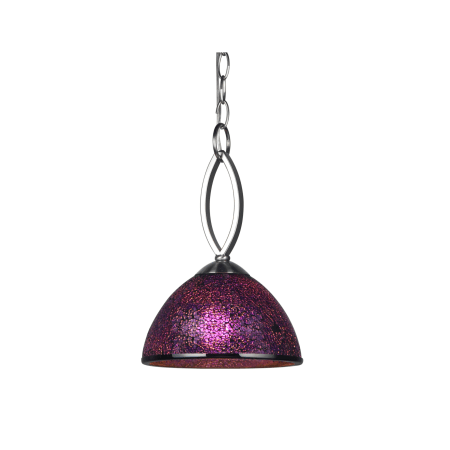 Another option to incorporate jewel tones into your home décor is through lighting. Lamps are an easy way to add a splash of color, and they’re not as permanent as installed light fixtures. 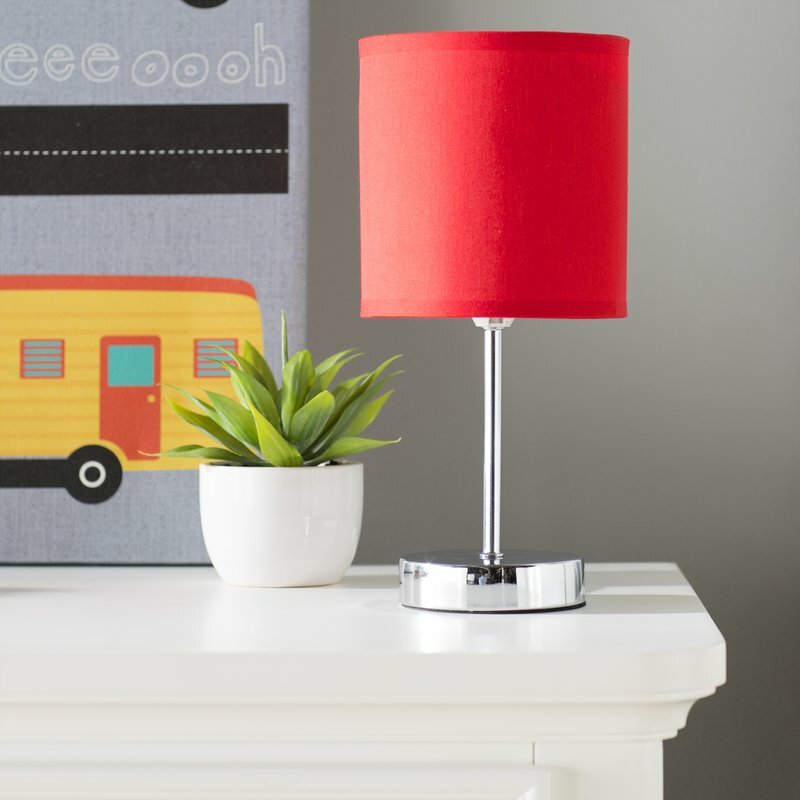 The Louis Mini Basic 11.81″ Table Lamp has a bright red shade and a very simple silver base. This size lamp works great on a buffet or foyer table. If you decide to change your décor in the future, you could easily change out the shade for another. 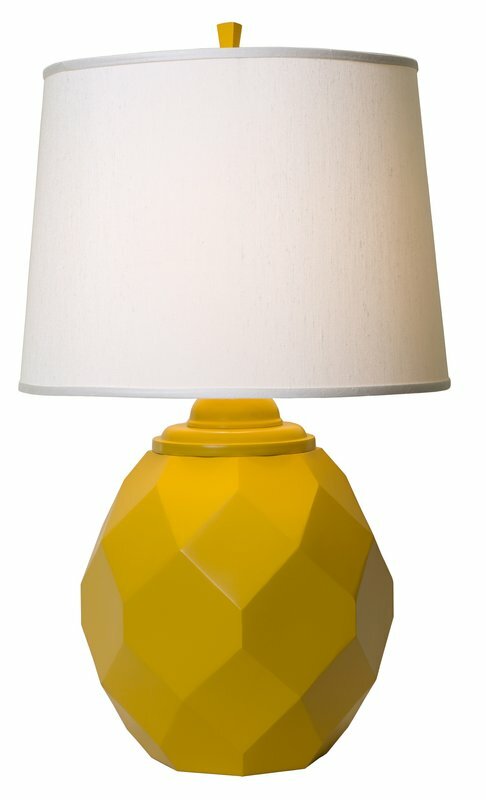 For an even bigger pop of color, this Jewel 27” Table Lamp by Thumprints is bright yellow with geometric lines that will add variety to your interior style. By the way, the founder of Thumprints, Allison Davis, is a graduate of the University of North Carolina at Chapel Hill. Go Tar Heels! Need a taller option? 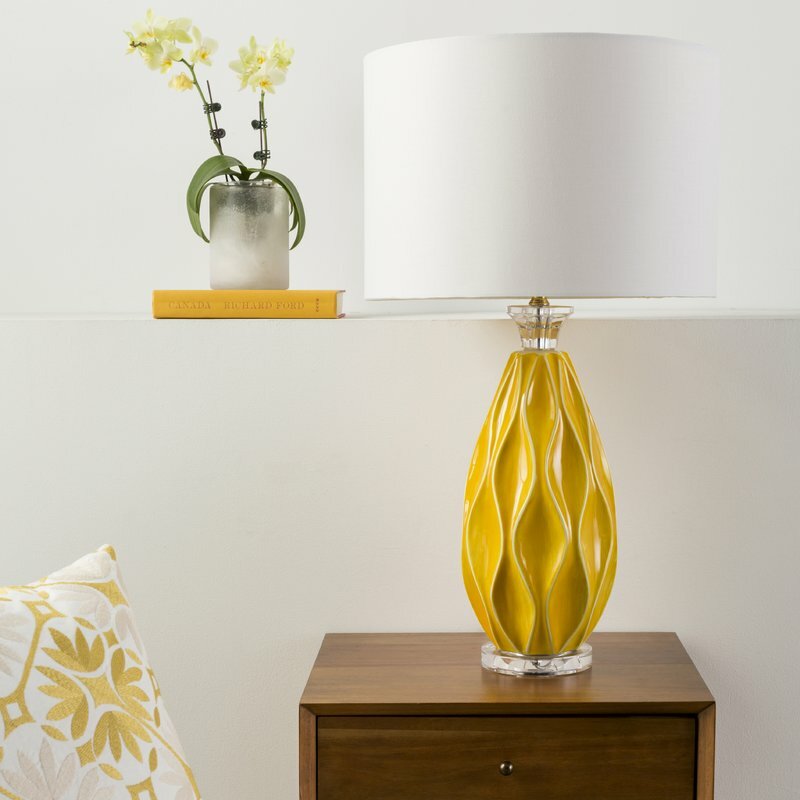 Brayden Studio creates a Morlan 28.5″ Table Lamp, also in bright yellow. This one is more floral-inspired than geometric i.e. more curves than edges. 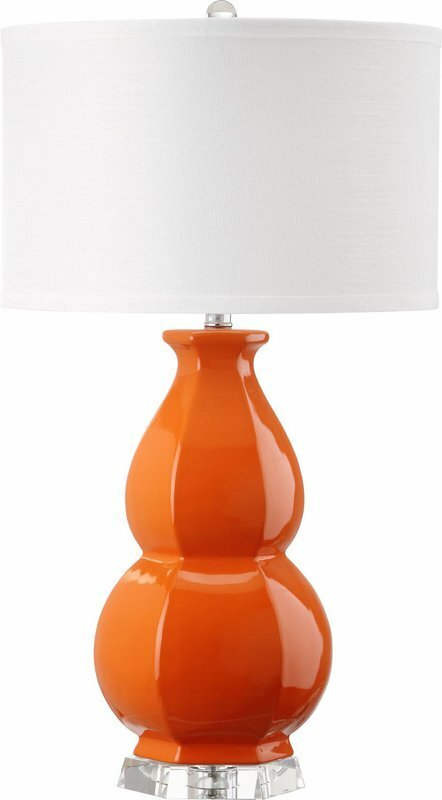 The Barcenas Table Lamp by Wade Logan is another ceramic jewel tone lamp, this time in bright orange. For homeowners willing to make the leap to installed lighting, jewel tone options are limited, but there are options. 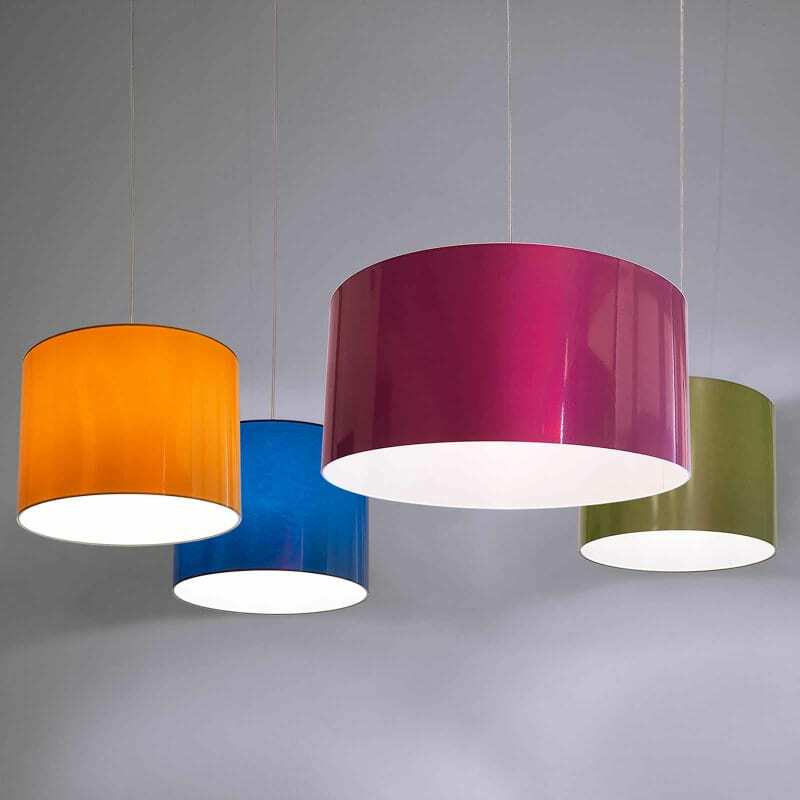 These pendant lights by Innermost are one example. They come in multiple sizes, so you can go large or small, and they have solid shades so the four available colors don’t look washed-out. 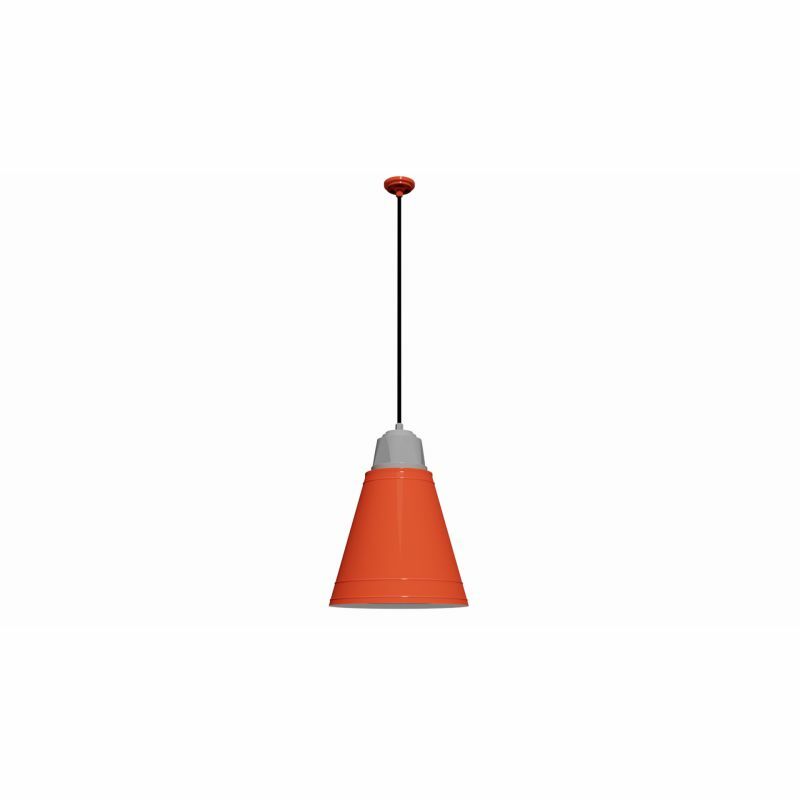 There are also retro style pendant lights from ANP Lighting. They come in orange and aqua green, as well as two lengths. Finding jewel tones in glass light fixtures can be difficult, because colors can look washed out when the light is on. That ruins the intentions of the trend – bold and edgy. However, Woodbridge Lighting does a nice job with its mosaic mini glass dome pendants. While lit, they are a pretty royal purple and bright red. Whichever type of lighting you choose, make sure the color is rich so it stands out well against the black and/or white background of the room. The easiest way to incorporate jewel tones in your décor is by updating your art and collectibles. One of our favorite places to shop for art is on Etsy. There are so many creative people selling prints and one-of-a-kind pieces, it’s hard not to spend hours looking through everything available. On Etsy, there are a few ways to buy wall art. The first is a digital download. This means you are purchasing the rights to download and print a piece of artwork for display in your home. You cannot re-sell the artwork, but this gives you the opportunity to choose the best size and material for your needs i.e. print the artwork at home or pay a professional printer to print it on canvas or metal. 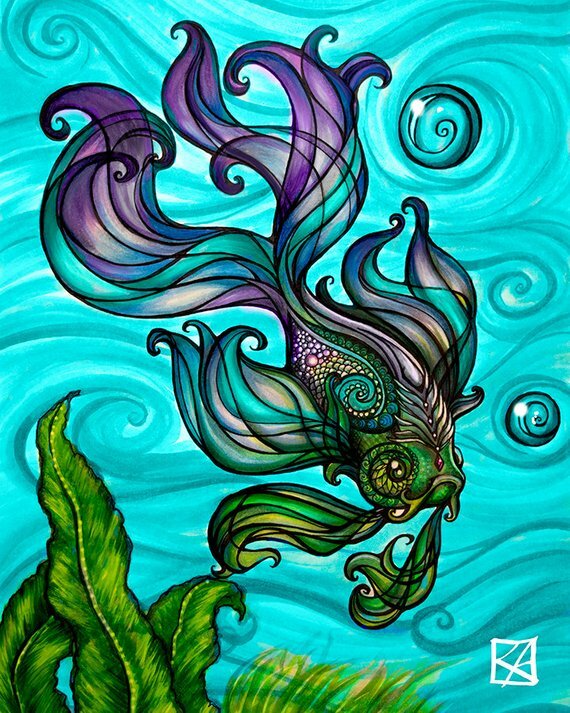 You can also order prints to be shipped to you, like this beautiful jewel tone print of a betta fish called Zen Betta the Second by Karen Adams. Just choose the size you want. Finally, you can order original artwork in all sorts of mediums. 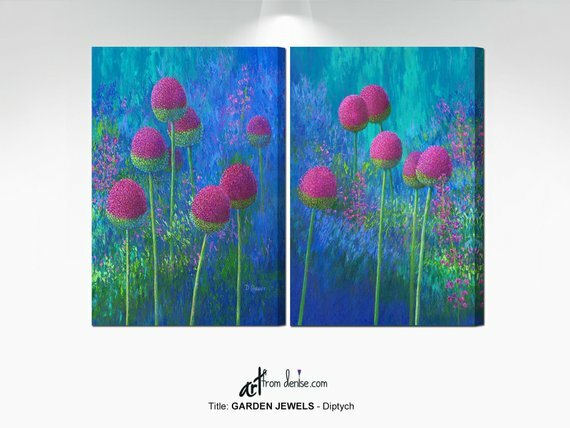 This abstract floral in jewel tones by Art from Denise is painted on a textured cotton canvas with acrylic paints. It’s made-to-order and measures 36″ tall x 48″ wide x 1″ deep (or you can contact the seller about custom sizes). Check out Denise’s other works, as well. 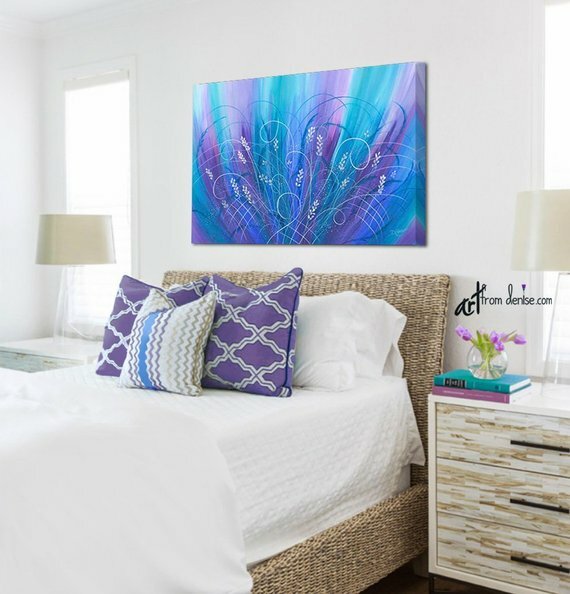 She has multiple pieces that fit this trend, like this purple and blue abstract flower. Not into flowers? 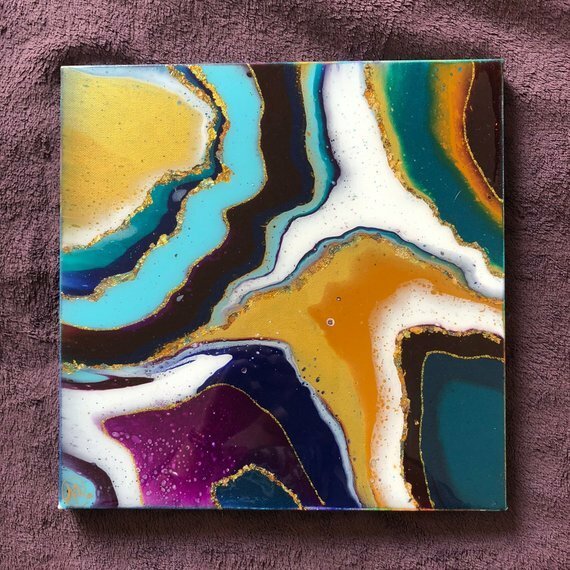 This jewel tone “puddle pour” piece from Color by Amber Line has light blue, dark blue, teal, gold, and magenta rings of color. Glitter and gold leaf highlight the rings and the whole piece has a resin glaze. As a result, the image resembles agate rocks. Of course, there is more to art than just paintings. 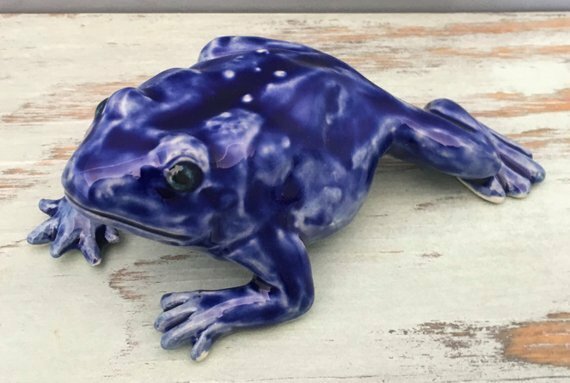 This hand-crafted jewel tone frog from SophisticatedMud comes in blue or green and would look perfect sitting on a mantel or shelf. 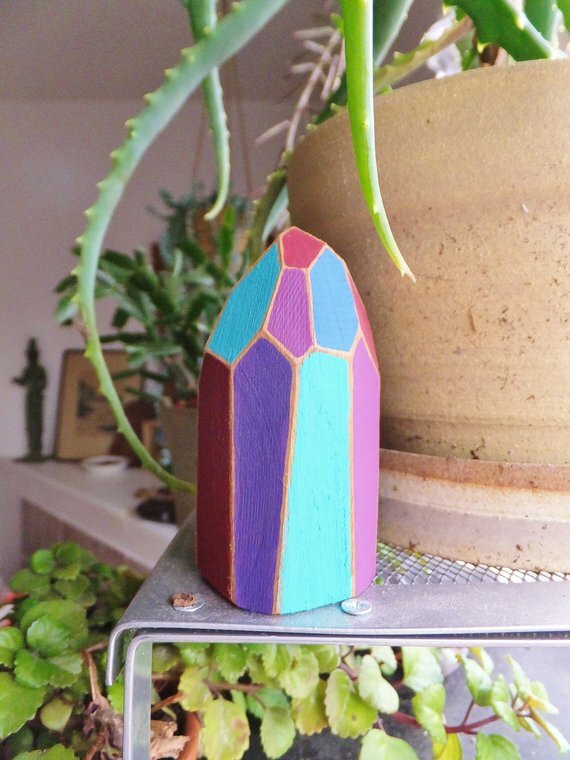 This wooden jewel tone crystal sculpture by BlendedSplendid would make a great accent piece for a desk or bookshelf. Love bonsai trees but fear the upkeep? 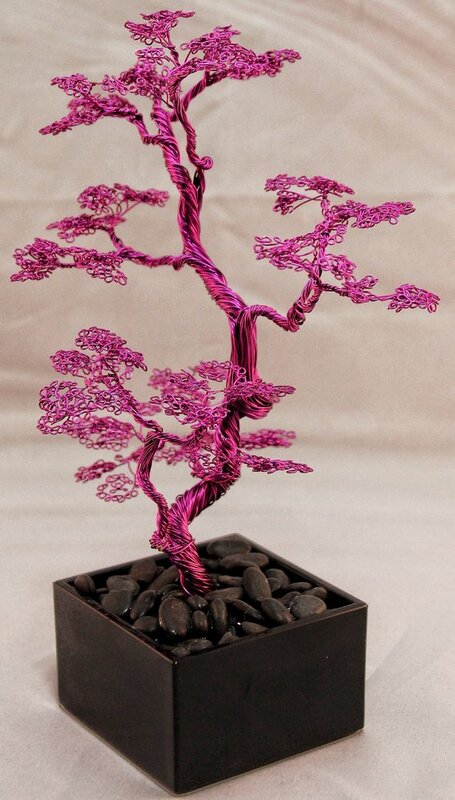 This magenta wire bonsai tree is beautifully intricate but doesn’t require pruning or water. Have a sense of humor? 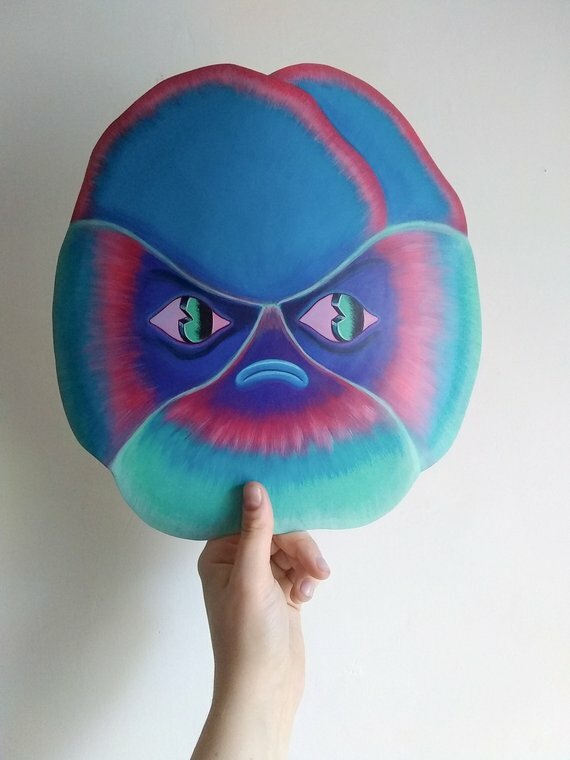 This Giant Cranky Pansy by AGBlend13 will give you and your houseguests a chuckle. But there’s more to it than meets the eye. It’s painted on reclaimed 20-gauge aluminum. How’s that for recycling? 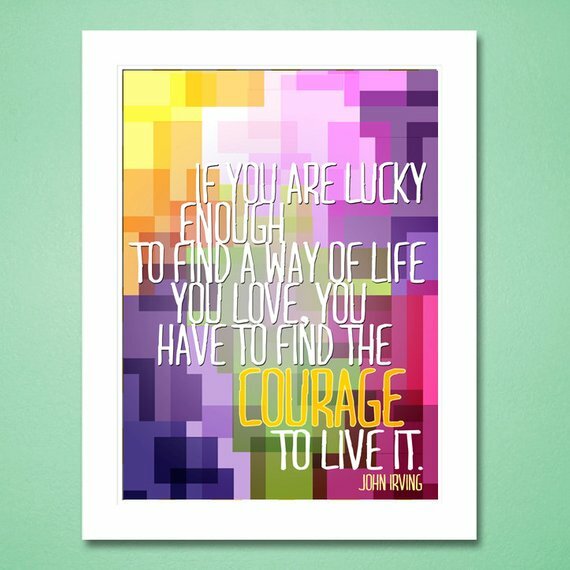 When it comes to jewel tone art, it’s really whatever fits your fancy, but the bigger and bolder the better. Have you decorated with jewel tones? Share your experience in the comments! 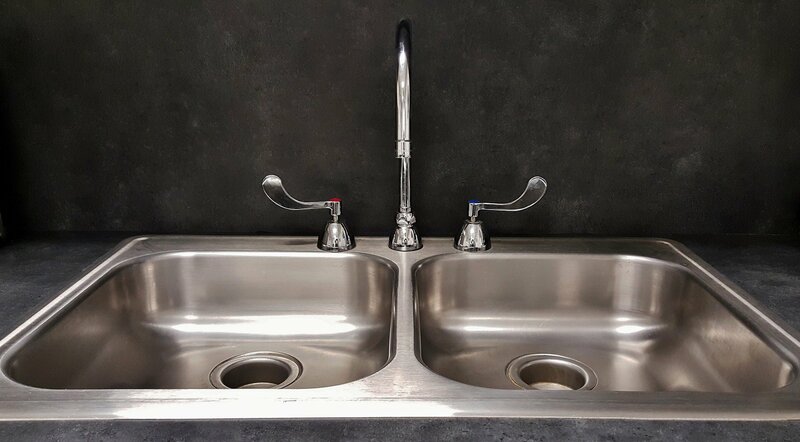 This is Post #2 in the 2019 Home Trends to Watch Series. See Post #3 – Warmer, Darker Countertops and Boldly Patterned Backsplashes.